Hope you all enjoyed your long weekend, courtesy of the Queen. I’m sure there were a few people out there nursing a hangover, thankfully I wasn’t one of them. Having an extra day off work and with the weather being all rainy and miserable, it was a perfect opportunity for me to bake. Any excuse really! In light of the Queen’s birthday, I thought it would be appropriate to bring a touch of English flair to the weekend and what could be more English than scones? There is nothing better than enjoying a cup of freshly brewed tea with a nice warm scone served with jam and whipped cream. And with this cold weather, who could resist indulging in such a treat! You can make so many different variations of scones from date & lemon, cheese & bacon, to pumpkin, just to name a few, but I’ve gone for a variation of my own, fig scones (after finding dried figs in the fridge that needed to be used up!). 1. Preheat oven to 220 degrees. Grease a baking sheet or line it with baking paper. 2. Soak the figs in the black tea for at least 30 minutes. 3. Sift the dry ingredients together in a bowl: flours, baking powder, salt and xanthan gum. Stir in the sugar. 4. Cut up the butter and rub it into the dry mixture until it resembles fine breadcrumbs. Add the drained figs and egg to the mixture. 5. Add three quarters of the milk and mix it in quickly with a knife. Add the remaining milk to mix to a soft dough. Don’t overmix as this will make the scones tough. 6. Turn the dough out onto a lightly floured surface and pat or roll out to 2cm thick. 7. Cut out the scones with a floured cutter. Gather any trimmings, roll into a ball and cut more scones. 8. Place the scones on a baking sheet and brush the tops with cream or milk. 9. Bake near top of oven for 10-12 minutes or until the scones have risen, are lightly browned on top and the bases sound hollow when tapped. Cool on a wire rack. 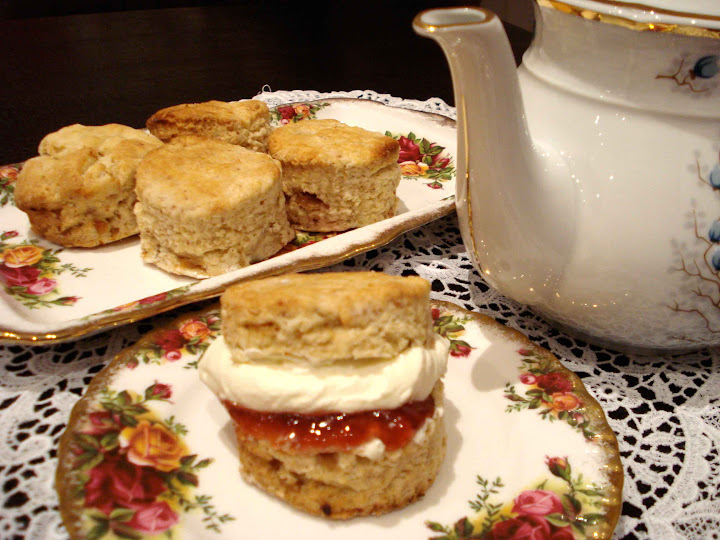 Enjoy scones with nice jam and freshly whipped cream, yum!